Well almost! It had rained so heavily yesterday that the woods were awash. I decided to go anyway because I didn’t want to run on the treadmill and I really wanted to take Murphy Dog with me. I started off reasonably, ignoring the pace of the music I was listening to. 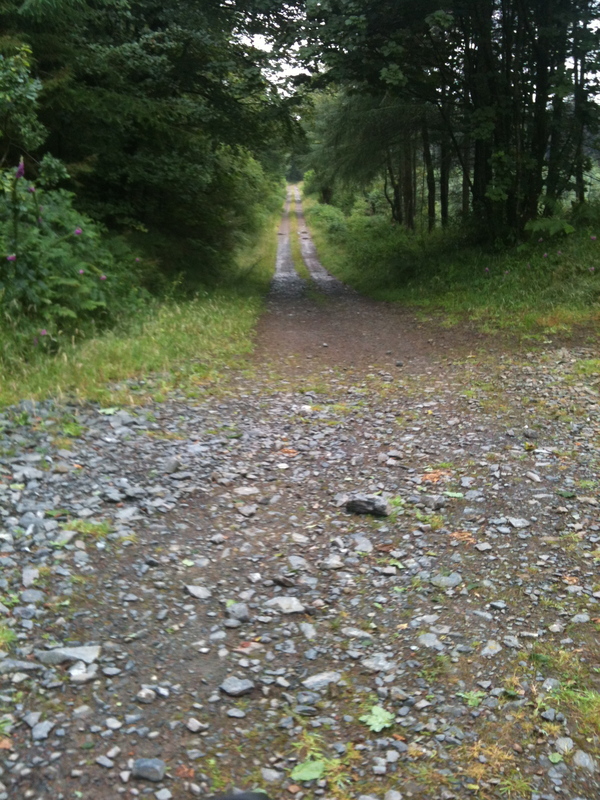 The first part of the track consists of rocks and they were like ice. Before I rounded the second corner Murphy darted off to the right and stood looking into the trees. I couldn’t see what he was looking at and carried on. As we turned the corner I spotted a figure walking towards us. So did Murphy and he was terrified. Why? I don’t know. He is generally a very confident dog, but now and again some things just spook him and he freezes. I only realised that he was stood stock still after a wee while and stopped to call him to me. As I called him I discovered what he had seen earlier. A red deer wandered casually onto the path within a few feet of Murphy, stood behind him and looked straight at me. It was a wonderful moment. Murphy had no idea that the deer was there; he was still focused on the man walking towards him. Amazing! The deer walked off into the trees at the other side of the path, Murphy still none the wiser! The rest of the run was pretty uneventful, although I did stop to take some photos of the trail at the mid way point. I wasn’t racing, but I was working hard on the terrain, so stopping to take a photo or two was by the by. 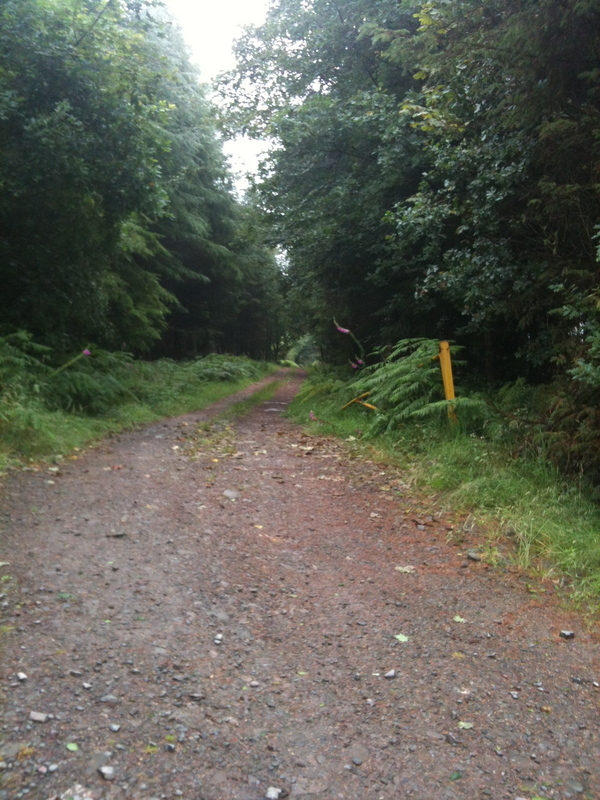 This shows the route down to the new part of the woods that has been opened up by the timber guys. The picture doesn’t really show how steep that is. I’d love to be able to run down it at full tilt, but with all those loose stones it’s just not possible. This is the route I run down to this crossroads. There is a fourth trail, but it dies away pretty quickly. 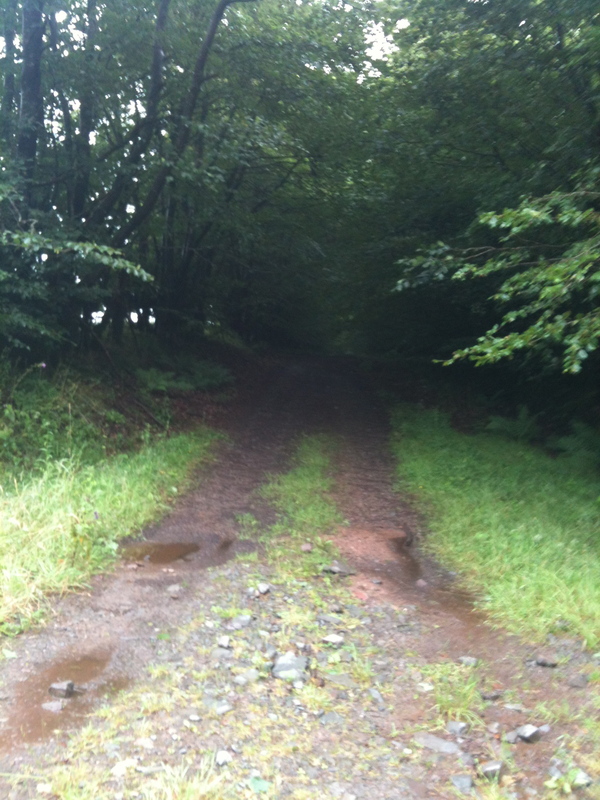 This path leads back to our house. If I wanted a shorter route I can head up to the castle drive. It means running just over half a mile on tarmac and the trail between this point and the tarmac can be very messy, with deeply rutted mud tracks. I only go this way if the weather has been dry for a while. It’s sheltered by trees, as you can see, and rarely dries out. 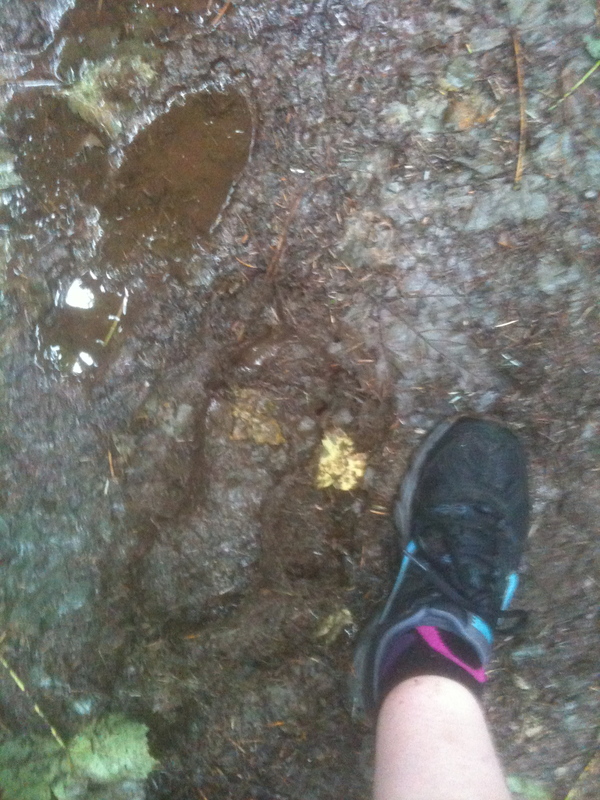 That shows my footprint on the way down to the second turn. Not the worst I’ve found the conditions here, but quite slippery. My splits were identical for each mile, which I find amazing considering the fall of the land. At 10:52 pace it wasn’t the fastest I’ve run that course, but it was a good solid run after a hard long run on Sunday and I’ll take that thank you very much! Comlongon Castle in the background, across the field. I took Murphy into the shower when we got home. For a white dog, he was very black! He doesn’t mind being in the shower and is very well behaved. I then ate quite quickly afterwards – finishing off the stew from last night. I’m feeling good. Good enough to tackle the ironing I guess!! After yesterday’s collision with The Wall, I have started to look more carefully at how I eat, especially with longer runs coming up. To be honest I hadn’t really thought about 10 miles being “a long run” which is wrong of me and slightly worrying too! Not so long ago running to the end of the street was a long run, now I’m not blinking at the thought of ten miles! Anyway, I thought I’d share my food (not literally, more of a etherial moment for you all) and this might help me to be more conscientious. That’s the plan anyway. All my calorific details have been worked out using the wonderful (and free) app called My Fitness Pal. 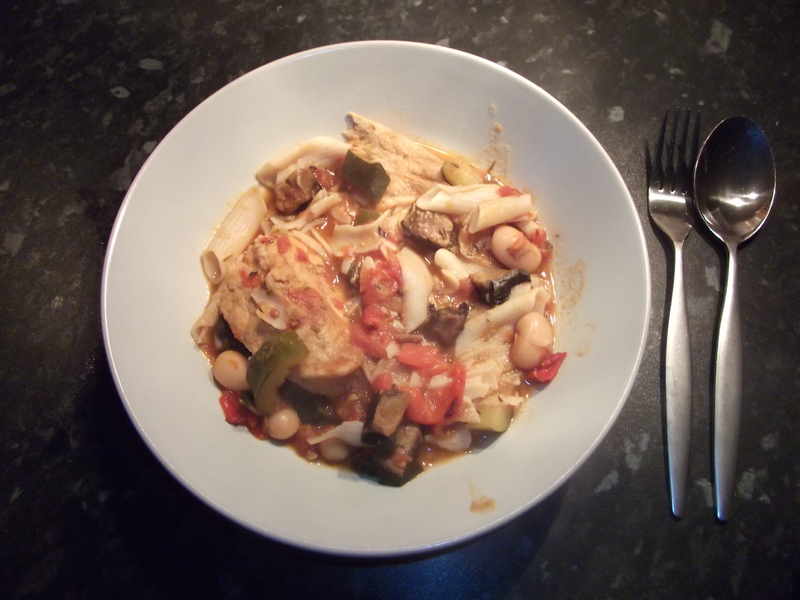 Quorn Stew (third of a tin of chopped tomatoes, half a courgette, half a sweet red pepper, field mushroom, 50g butter beans, two Quorn fillets, vegetable stock cube mixed in 400ml water, rosemary and thyme – all simmered in a pot for an hour) 50g brown rice pasta (gluten free) added at the end. I looked up an online Daily Calorie Needs Calculator and put in my weight/height/age and exercise data. The exercise was based on three times weekly but, as I do some cross training and I’m looking at these longer runs, I upped this to an average 5 times a week. This told me that I should be looking at between 1800 and 1900 calories a day just to maintain my present weight. I’m obviously falling far short of that. As I won’t be drinking anything other than grape juice tonight (approx 65 cals/100ml) I can only add another 140 cals for that! I’m still coming up short of even the minimum target. As a dieter in the past I know that I can go over on some days and be under on others, so I’ll keep up with the app and see how it works out. I have to add that I am not losing weight at the moment. My weight varies between 66kg and 68kg and has done for a year. I reached a plateau of about 65kg and haven’t dipped below this, no matter what I’ve done. What I don’t want to do is over eat and end up putting weight on. Well that’s today isn’t it. I know that because when I tried to sit up in bed this morning my glutes didn’t work. Desperation for my morning cuppa made me struggle into the sitting position; I’m not a woman to be beaten by a few tired muscles! I’ve been really good doing my Daily Ab Workout on the days in between running and it’s tough, so I know I’m working hard! I’m only following workout 1 for 5 minutes at the moment. The second it starts to feel easy I’ll crank it up. Thursday was my 10th wedding anniversary and we had a table booked at a local restaurant at which I know I can get superb food (with all my strange dietary requests). Before that I needed to get my 30 minute run in so I decided to just hop on the treadmill. Again I struggled at the start, but gradually worked through the tightness I was still feeling. My right hamstring feels tight, but my chiropractor said it was fine at my last visit so I wonder if it is my glutes that are the tight ones? I did 5k in 30:32. Meh. I must admit that I skipped the easy walk planned for Friday, but as I park my car a good distance from my work I guessed that would make up for that! 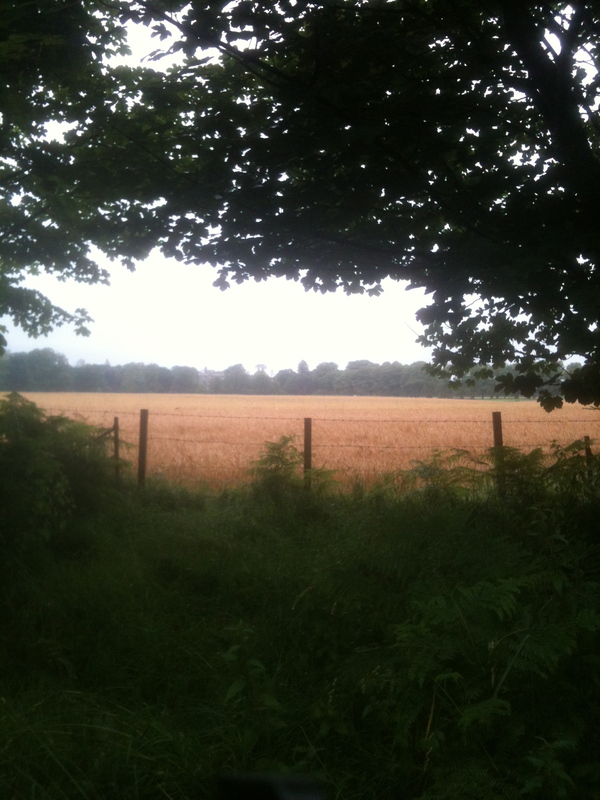 On Sunday I was due to cover between 9.5 and 10 miles, depending on what you read. I was running with Jeff’s app in my ear, dictating my pace and distance. As we set off it flicked up that I was going to do 9.8 miles, two laps of the Twathats route (which, I’ve discovered, is pronounced Twaites!) My husband had decided to follow me on his bike, which meant I’d have company of the quietest kind. Usually my husband is a very chatty bloke, but he stays very quiet when I’m running, so much so that I find I’m initiating the conversation! It was a hard run. Not because it was long, but because the God of Wind had decided to toy with me. We knew that it was windy but, as our house sits in a low and fairly sheltered spot, we had no idea just how windy it was. I ran the first mile within my target pace, which was great because it was all uphill. The second mile is mostly downhill, so that came slightly faster and then we turned south. Gusting up to 30 mph the wind hit us full on. Unfortunately most of the second half of the loop I’d chosen is south facing. That’s a grand total of 5 miles of running into an invisible wall, at least that’s how it felt! Unsurprisingly my pace slowed. Mile 4 11:26, mile 5 11:26. And then effect of running into the wind carried on as I turned north. I ran up the long hill out of Ruthwell Station a full minute slower than I’d run it first time round. Now I know that I was fresher on the first go round, but a minute is a big difference! I did speed up a little bit on the downhill, but still. I finished the 9.98 miles in 1:54:03, giving me overall pace of 11.26. I did keep trying to pick the pace up, but with the wind blowing fiercely, I just couldn’t do it. By the end I was knackered. There is no other word for it! I am proud of the fact that I ran up every hill on the course without slowing down. I even out ran two cyclists going up Potato Hill on the first circuit. I did feel strong, despite the weather conditions. After coming home I took a hot bath. My stomach was grumbling loudly throughout so I knew that it was time to eat! I was starting to feel weak. It’s true what they say about eating within 90 minutes of a run. I started cooking dinner a full hour after the run. By the time I was almost ready to dish up I was having to take breaks and lie down as the colour drained from my face and I felt as if I was going to be sick. This must be The Wall, the place at which you have nothing left to give, nothing left to function normally, no energy left to even stand. I’ve never felt like this before. I managed to serve dinner and almost went to lie down before having mine, but my husband convinced me to sit down and try to eat. I really didn’t want it, but I started to force down forkfuls of onion mash, courgettes and green beans, I couldn’t face the Mozzarella burger yet! I started to feel better almost immediately and ate the rest ravenously, going on to have cheese and biscuits shortly after. This led me to wonder how well I was fuelling up before the run. Prior to running I’d had two eggs, a field mushroom and a single slice of toast for breakfast and then a spinach and avocado salad for lunch with some Quorn pepperoni slices. This is fairly common for me. I used up 1000 + calories doing the run and obviously the above doesn’t come close to being 1000 calories. I realise that I had some energy in reserve from the night before, but still – had I under fuelled? I’m going to start keeping a log of my intake and expenditure – just to make sure that I don’t hit The Wall on a run. It was scary enough hitting it at home, with my bed to flop onto, I don’t fancy crawling home from a few miles out! Do you have any similar experiences of this phenomena? Yesterday I blogged that one photo of me had hit the cutting room floor because I looked so damn podgy in it. It was my pre-race photo and, whether it was the vest I was wearing or not, I just looked awful. I am not a lightweight. Since starting running my weight has dropped by about a stone, but hovers between 10 and a half and just under 11 stone. I hate dieting and my diet is so restricted by my food choices and allergies anyway that it makes dieting difficult. I don’t eat rubbish; I eat to fuel. I could maybe cut down on portion sizes, but that’s all. I eat proportionately; mostly veg/salad, protein and some carbs, with very little fat, especially saturated. I know how to eat. What would make a huge difference to my physique would be to get that belly fat away and toned. I’ve been told that it may never disappear, but I’m willing to try. My son, who is training to be a personal fitness trainer, gave me a freebie ab workout recently, but now expects to be paid for more! What a cheek!! Maybe I should start charging for food, electricity, broadband etc etc! What seems to have passed him by is that HE is the reason why I have podginess; had he have moved into the natural birth position and not decided to be breech and huge, I wouldn’t have needed a Caesarian Section! My muscle strength may never totally recover because the muscles have been cut twice now (the second time five years after my son’s birth when I suffered an ectopic pregnancy) and apparently they never properly heal. I don’t know how true that is. What I have done is download an app for my iPad called Daily Ab Workout by Daniel Miller. In each workout there are ten exercises. You choose the exercise length by adjusting the overall workout between 5 and 10 minutes (which is then divided by 10 to get each exercise duration.) There are three workouts, each with it’s own set of exercises. I paid 69p/$0.99 for the app (there is a free version to try) which makes it more adaptable. For example, there is a choice to create a routine, focusing on the exercises that you want to use – i.e. the one that are going to work the area you want. It’s certainly cheaper than paying my son! I’ll try this today, as it’s a rest day and do this at least on my days off running. In the meantime I’m off to my local sports shop in search of a more flattering top!!! I hate acronyms; their only function in life is to make people feel out of the loop, so I apologise for my title. I was just too excited to type the whole thing! 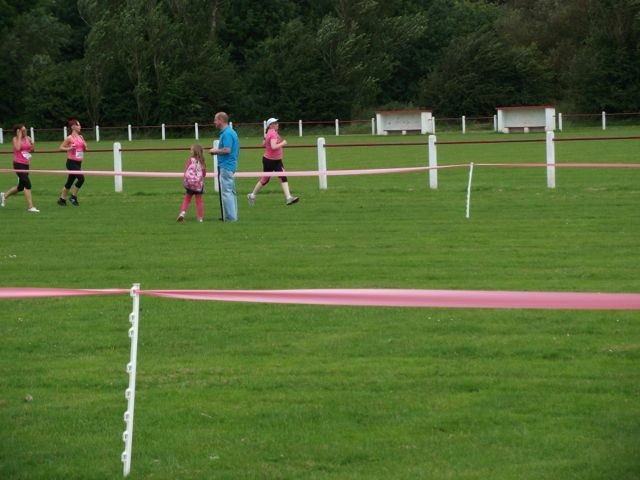 Today I ran the Race for Life in Carlisle for Cancer Research UK. I ran the same race last year, my first race since Nineteen Canteen when I was schoolgirl who could probably run much better than I can now. In fact I still have the school report that glamourised my cross-country prowess and suggested that I was a “promising 800m runner”. If only I’d kept it up. No, scratch that – I’d probably in line for a knee replacement or two by now! A little more complacent than last year, hubbie and I arrived slightly later this time. We were greeted by the sight of the nearest car park filling up quickly and so chose to park a little further away and walk in. The walk gave me time to warm up properly and meant that we could escape at the end without waiting in queues of traffic. 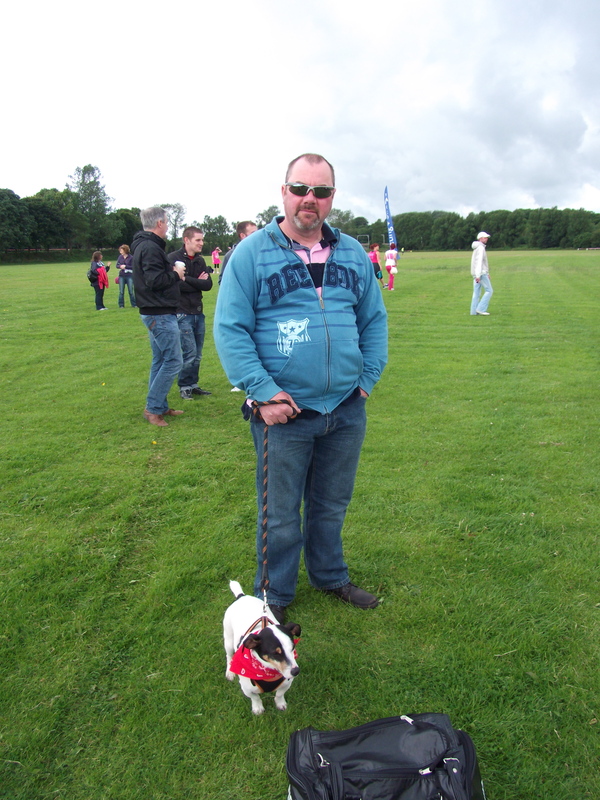 When we eventually arrived at Sheepmount Stadium (we have the BEST named places round here!) I was one of around 3000 women, most dressed in pink, some dressed in tutus, feathers and hats! I felt slightly underdressed. Here you are meant to see a photo of me before the race, but it hit the cutting room floor when I saw too many podgy bits. Just imagine me. 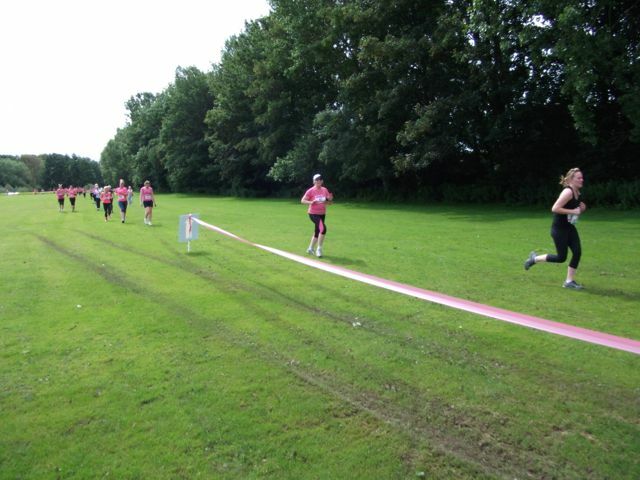 I missed the warm up as I was queuing for the loo, not that it bothered me too much; I never warm up like I’m doing a bootcamp, so why start just before a race? As I watched people doing stretches and lunges I could just about hear hamstrings twanging. It’s not for me. The organisers have this down to a fine art. Runners headed for a blue banner, labelled ‘Runners’ unsurprisingly, joggers and walkers to two other banners and those with wheels had their own starting gate. I was in the middle of the runners. The starting horn blasted at exactly 11am and we jogged off towards the start tunnel. I hit my Garmin and my Easy 5k app as I crossed the line. My plans for starting easy and gradually cranking things up went quickly awry. I had forgotten just how much of the course is on grass. In my memory I remember running across the field from the start, circling to a path and then eventually returning the same way. What I omitted was the three other fields we ran through. Gulp! My target pace was 9 minute miles. On the path, what little there was, this was a cinch. On the grass, soft, bouncy, rutted grass it was difficult. At times I could feel my footing giving way and I was fighting gravity. I was determined to run my full 4 minutes at a faster pace and then ‘rest’ on the minutes in-between. My plan was to take walk breaks to the last mile and then run to the finish, hopefully bringing my overall pace up. My only thought as to break my 30 minute 5k target. That’s me with the hat! My first mile passed in 9:19. So long as I was under 10, that was fine. By mile 2 the grass running had taken it’s toll and I managed that one in 10:05. By the time Jeff told me that I had just once mile left my earphones were off and I was just running as fast as I could across the grass to the finish. I forgive the two girls who caught up with me in the finishing straight and overtook me at the line because I think I might be old enough to be their grandmother. Legally even. Sad, but true. I finished my last mile in 10:15, crossing the line in 28:16.6. The clock above the finish line said 28:11, but as my Garmin showed the course as just short of five kilometres I’d rather go with my data than theirs! I’m not quibbling over a few metres or a few seconds. So there we are! My time last year over the same course was 30:12. I knocked almost a full two minutes off that time, which is great. On Monday I get back to my Great North training, with only a 10k in September between now and then. I am happy that what I am doing is making a difference. My only big worry is my kit. I seriously need to find some more flattering running tops! It’s a true dilemma. I’m sitting here rehydrating on copious cups of tea because I forgot to drink my usual pint of water after the party I attended last night. I didn’t drink much at the party because I knew I was running this morning and would need to be on tip top form (ha). I maybe had two or three pints of Guinness, but I woke at 3am needing the loo and feeling dehydrated! How does that work? You’re either hydrated or you’re not! What I should have done was get a drink of water then, but I didn’t. I’m on my second cuppa and I think I’ll need one more once I’ve written this. I got up at 7 because I’d been going over race strategies for the last couple of hours in my sleep. How sad is that? 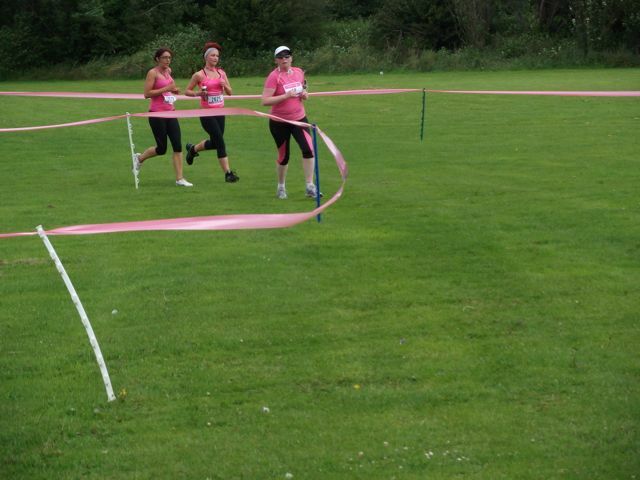 Today I have the Race for Life 5k for Cancer Research UK for which I’ve raised £120 so far. I rarely run 5k races alone. 5k is the only distance my husband will run so I tend to run those with him at his pace. So I don’t often get a chance to see what it’s like to race at this distance and I think that’s making me a bit nervous this morning. After my super dooper treadmill run in the week I had a less than super run on the grass so I’m left not really knowing where I’m at. I’ve been stressing about whether to run the entire distance at 9 minute mile pace or take walk breaks, as I’ve done throughout all of my training bar a few runs on the treadmill. I put the kettle on and picked up my iPhone and found Jeff Galloway’s Easy 5k app, looked for Race Day and listened. I heard what I needed. Jeff said take walk breaks early on, get into your stride and then run the last mile. Yes, that’s the answer I needed. I can get my breath sorted (Little Miss Asthma) and then, once I’m in a good place, I can go for it. Its replicating my good treadmill run by starting off easy and gradually building up my pace. 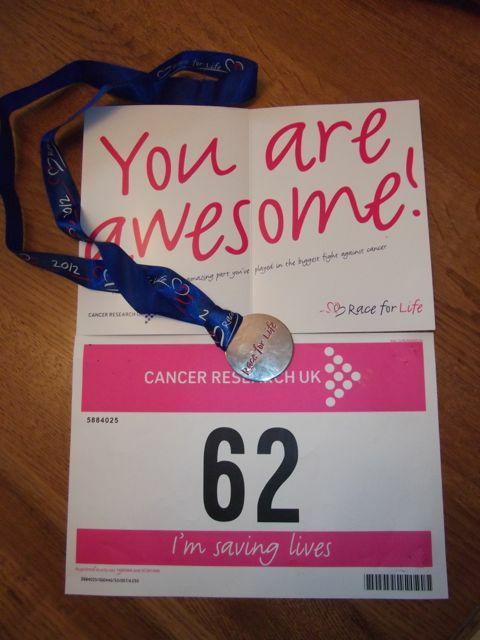 The Race for Life last year was my first race since starting running and last year I did it in 30:12. I’d like to crack 30 minutes, but I realise that this is huge event, with many walkers on the course and 1km of grass to cover. I’ll do my best. So, there you are. I’ll see you all later. It’s 9:15 at night and I’m sitting here feeling very, very guilty. I should have run tonight and I haven’t and I’m sorely tempted to just hit the treadmill. I was late coming home, had to ring my folks to thank them for sponsoring me big time for Sunday’s race and make dinner. And now I’m running out of time. Have I got enough time to run now? If I don’t I’ll be running first thing tomorrow, the day before my race and that’s not good either. Argh! This is what separates me from better runners. I allow life to intrude on my running! I’ve been told this before and it’s true, but it’s what makes me who I am and I can’t apologise for that! EDIT: What am I doing to myself? It’s Thursday today, not Friday. I can do my run tomorrow and STILL have a day off on Saturday. Panic over! Carry on everyone!